March (Aries) as a mounted warrior in 'Typikon'. Byzantine Trebizond, Vatopedi Cod. 1199, 1346AD. This codex essentially contains the formal directions for the Church services throughout the year, and additional texts. It is written in minuscule script in straw-coloured ink, with twenty-two lines of single-column text per page. The text length is reduced by one or more lines on the last folios and on pages with illustrations, in which two columns are used. On the last folios, containing the service for the blessing of the waters, the script is different and more carefully done. The binding, of later date, has a red leather spine and blue cloth on the covers. The illustration of the codex begins (fol. 9v) with a picture of St John Damascene and Sabas, who both wrote typika. The principal illustration, however, is to be found in the text containing the services for the whole year, starting with September, the first month of the Orthodox Church year. Interestingly, each month begins with a representation of its zodiacal sign, and a farming or other scene appropriate to the season. Thus September (Libra) shows the vintage, October (Scorpio) a hunting scene, November (Sagittarius) plowing and sowing, December (Capricorn) pruning, January (Aquarius) storing oil and wine in jars, February (Pisces) resting, March (Aries) a mounted warrior, April (Taurus) a youth holding a garland in his right hand and a lamb in his left, probably signifying Easter, May (Gemini) a youth with flowers, representing Spring, June (Cancer) again a young man with flowers, July (Leo) a harvest scene and August (Virgo) a young woman approaching a recumbent old man, holding a jar in one hand and in the other an unidentifiable object that she seems to be using as a fan. This scheme of illustration is most unusual and is rarely found in manuscripts. 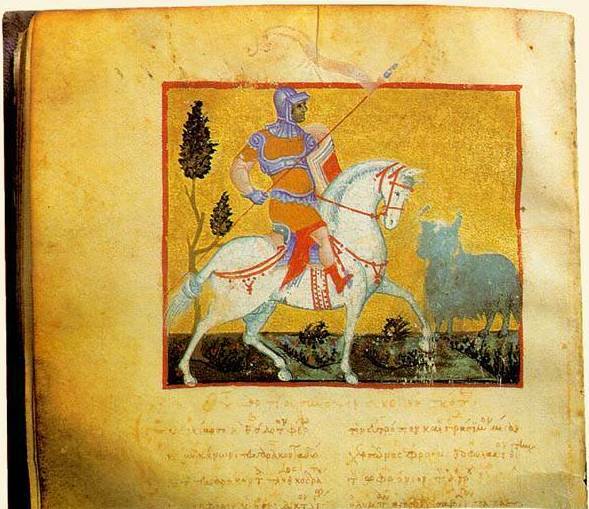 The manuscript mentions that the text was written by Ioannis Argyros in the 6584th year from the Creation of the World (1346 AD), commissioned by Procopios Chantzamis and donated to the Monastery of the Great Martyr Eugenios the Wonder-Worker, probably at Trebizond (fols. 3r, 9v and 307r). There is a portrait of Eugenios of Trebizond at the end of the manuscript (fol. 315v). The illustration is completed with simple band-shaped headpieces and initials with flora decoration. The notes identify neither the artist nor the provenance of the manuscript; however, its illumination was very probably executed in Trebizond. 60. Trapezuntine Byzantine Cavalryman, 14th century in Armies of the Middle Ages, Volume 2 by Ian Heath, based on March (Aries) as a mounted warrior in 'Typikon'. Byzantine Trebizond, Vatopedi Cod. 1199, 1346AD.